Calendar of Treasury Books, Volume 24, 1710. Originally published by Her Majesty's Stationery Office, London, 1952. Kay, Josia, the Queen's Locksmith, petitioner, 606. Keene, John, landwaiter at Lynn Regis, appointed collector of Wells port, additional salary, 354. Kegwin, Robert, petition re seizure of ships, 328. Keightley, Thomas, Excise Commissioner, Ireland, 467; one of the Chief Commissioners and Governors of all Revenues in Ireland, appointment and salary, 467. Kelling, co. Norfolk, East Marsh in, lease of, 321. Kellit (Kellet), Edward, weighing porter (weigher in fee), London port, 314; dismissed, 319. Kellum, George, serving as Brigadier in Flanders in 1708, additional pay for, 397. Kelso, co. Roxburgh, Surveyor of Window Duties in. See Liddesdale, D.
Kemish, , captain en second in Stewart's regiment, half pay for, 155. Kempster, William, security for J. Parker, action brought against, 275. Kennedy (Kenedy), Margaret, Countess Dowager of Cassilis, royal bounty for, 392. -, -, Sir Richard, forfeitures accruing to the Crown by the death of, 18, 269; heir of, a priest, 18, 269. Kenrick, John, an executor of Sir Robert Clayton, payment to, 433. -, gardens, land added to, tithes and poor rate of, 516. -, Lord Chamberlain's lodging at, 373. -, Orders in Council, 312, 335, 385, 430, 433, 444, 448, 451, 456, 470, 472. -, dining room for Yeomen of the Guard, 348. -, Housekeeper at. See Lowman, H.
-, kitchen for the Vice Chamberlain, 348. -, Wardrobe Keeper. See Lowman, M.
-, Vice Chamberlain's lodgings, 160. -, warrants dated at, 298, 310, 316(2), 341, 343, 356, 371, 376, 390, 391, 414, 423(2), 424, 425, 429, 430, 443, 449, 456, 458, 461, 464, 465, 467, 547. -, brewers and maltsters in, frauds by, 227. -, coast of, complaint against Customs officers on, 591. -, Eastern Division, Customs Supervisor of, 354. -, House Duties in, Receiver General of, salary warrant, 448; and see Fausset, W.; surveyors of. See Montagu, R.; Whitmore, R.
-, Land Tax (Assessments) in, Receiver General of. See Fausset, W.
-, petition for place, 578. -, quarterly alterations in stations of, 403. -, Surveyor General of. See Baker, H.
-, sheriff of. See Fytche, Sir C.
-, Western Division, Supervisor of riding officers, 353, 354. -, wool from, transportation of, 514. Kent, Duke of. See Grey, Henry de. -, bills drawn by, 63. -, altered by Richardson, 67. -, fraudulent allowances in, 59(2), 63, 69, 70, 71; Customs Commissioners' signatures forged for, 61, 63. -, produced at the Treasury, 61, 67. -, going to Scotland, 62. -, in London, 61, 62, 70. -, memorial of, 93, 513, 606. -, ordered to attend the Treasury, 74, 82, 83, 93. Kentish, Richard, petition for lease of ground in parish of St. Giles, 305. Kenton, Benjamin, appointed tidesman in the inferior list, London port, 417. -, -, Thomas, appointed tidesman at Bideford, 269. 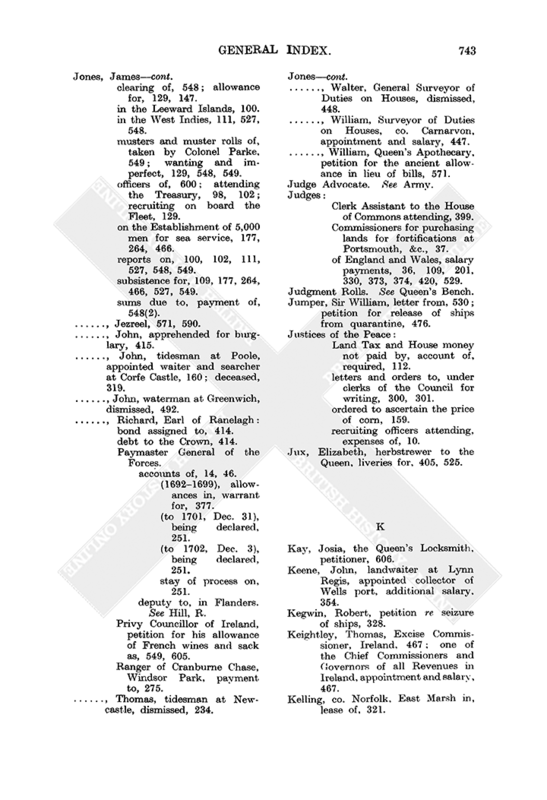 -, contingent warrant for carriages and disbursements, 206. -, petition of, 553, 604. -, companies of, Captain Campbell's company, 327; six men added to, 553. -, encamped in the Isle of Wight, 39, 421, 455. -, forage for, extraordinary allowance for, 125. -, fresh raising of, after battle of Almanza, 155. -, officers of, taken prisoners, 155. -, officers en second, half pay for, 155, 156. -, on establishment of 5,000 men for sea service, 125, 303, 340, 455, 502. -, ordered on shipboard, 303. -, subsistence, 39, 303, 340, 455, 502. Kershe, Anne, widow, royal bounty for, 392, 555. Kerston [Cairston], Orkney, Customs Establishment at, 410. Keys, Frances, relict of William, pension for, 184. -, -, William, groom to George, Prince of Denmark, deceased, 184. Kidder, Adam, lieutenant en second in Stewart's regiment, half pay for, 155. Kildare, Earl of. See Fitz Gerald, Robert. Kilkeedy, co. Limerick, rectory of, incumbent of. See Ormsby, Dr.; petition for annexing, to Deanery of Limerick, 198. 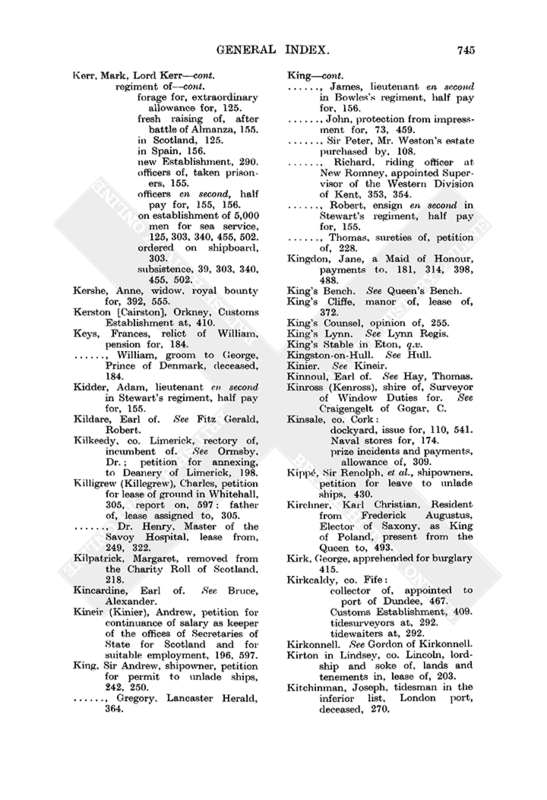 Killigrew (Killegrew), Charles, petition for lease of ground in Whitehall, 305, report on, 597; father of, lease assigned to, 305. -, -, Dr. Henry, Master of the Savoy Hospital, lease from, 249, 322. Kilpatrick, Margaret, removed from the Charity Roll of Scotland, 218. Kincardine, Earl of. See Bruce, Alexander. Kineir (Kinier), Andrew, petition for continuance of salary as keeper of the offices of Secretaries of State for Scotland and for suitable employment, 196, 597. King, Sir Andrew, shipowner, petition for permit to unlade ships, 242, 250. -, -, Gregory. Lancaster Herald, 364. -, -, James, lieutenant en second in Bowles's regiment, half pay for, 156. -, -, John, protection from impressment for, 73, 459. -, -, Sir Peter, Mr. Weston's estate purchased by, 108. -, -, Richard, riding officer at New Romney, appointed Supervisor of the Western Division of Kent, 353, 354. -, -, Robert, ensign en second in Stewart's regiment, half pay for, 155. -, -, Thomas, sureties of, petition of, 228. Kingdon, Jane, a Maid of Honour, payments to, 181, 314, 398, 488. King's Bench. See Queen's Bench. King's Cliffe, manor of, lease of, 372. King's Counsel, opinion of, 255. King's Lynn. See Lynn Regis. King's Stable in Eton, q.v. Kinnoul, Earl of. See Hay, Thomas. Kinross (Kenross), shire of, Surveyor of Window Duties for. See Craigengelt of Gogar, C.
-, dockyard, issue for, 110, 541. -, Naval stores for, 174. -, prize incidents and payments, allowance of, 309. Kipp, Sir Renolph, et al., shipowners, petition for leave to unlade ships, 430. Kirchner, Karl Christian, Resident from Frederick Augustus, Elector of Saxony, as King of Poland, present from the Queen to, 493. Kirk, George, apprehended for burglary 415. -, collector of, appointed to port of Dundee, 467. Kirkonnell. See Gordon of Kirkonnell. Kirton in Lindsey, co. Lincoln, lordship and soke of, lands and tenements in, lease of, 203. 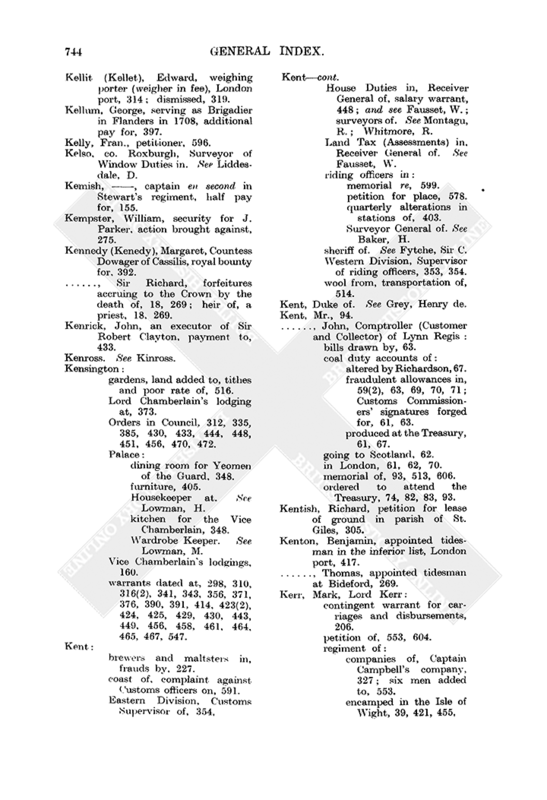 Kitchinman, Joseph, tidesman in the inferior list, London port, deceased, 270. -, affidavit of, read at the Treasury, 103, 603. -, attending the Treasury, 100, 101, 103, 603. -, coal duty account of, fraudulent allowance of three halfpence per chaldron for inspecting coal meters, 58, 59, 69; examination of Richardson re, 62, 63, 64, 70. -, examination of, at the Treasury, 103, 104. -, letter from, mentioned, 58. -, letters to, 489; mentioned, 59, 60, 64, 70, 71, 93. -, narrative in writing of his transactions with Richardson, required, 93, 489. -, son in law of. See Newby, [Oliver]. Knap (Knapp), John, creditor of the Royal Africa Company, grant to, of sums charged on the Company for contempt, 17, 212, 281. Kneeborne, Martin, petition for proclamation reward, 376. Knight, John, landwaiter at Bristol, deceased, 193. -, -, John, uncle of Rebecca Everard, lighthouses at Hunstanton erected by, 174. -, -, Richard, appointed riding officer at Lydd, 404. -, -, Richard, father of Richard, riding officer at Lydd, 404. -, -, Thomas, captain lieutenant en second in Bowles's regiment, half pay for, 156. 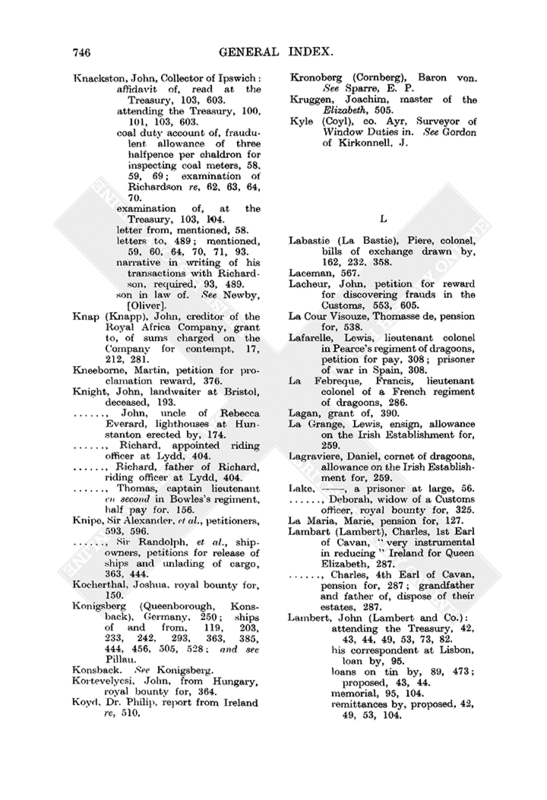 Knipe, Sir Alexander, et al., petitioners, 593, 596. -, -, Sir Randolph, et al., shipowners, petitions for release of ships and unlading of cargo, 363, 444. Kocherthal, Joshua, royal bounty for, 150. Konigsberg (Queenborough, Konsback), Germany, 250; ships of and from, 119, 203, 233, 242, 293, 363, 385, 444, 456, 505, 528; and see Pillau. Kortevelycsi, John, from Hungary, royal bounty for, 364. Koyd, Dr. Philip, report from Ireland re, 510. Kronoberg (Cornberg), Baron von. See Sparre, E. P.
Kruggen, Joachim, master of the Elizabeth, 505. Kyle (Coyl), co. Ayr, Surveyor of Window Duties in. See Gordon of Kirkonnell, J.